Thanks for posting this, I’m working through them and found that “eigo” had the kanji twice, instead of kanji and furigana. Thank you very much for pointing it out. I immediately corrected this. Where is the ゆ　character? Thanks for the list, as you can see I’ve been closely reading through all of it! Thanks for spotting this. I immediately fixed it. Thanks again. Thanks a lot for this wonderful list. It has helped me a lot !! You got a lovely site….. Thanks for the vocab list. However, there are no words starting with ゆ。Can u please include those too…..
@Deepa I am not aware of a word with ゆ within the JLPT N5 vocabulary. Please let me know if I missed one. what about yuki – snow? I found a few mistakes. 1) おきる (to place) should be おく. 2) 抜く (to take off shoes etc.) should be 脱ぐ. 3) There is no English translation for 見せる (“miseru” is listed twice). It is a long list and writing it with html is quite painful and mistakes easily happen. Thanks to contributions like yours the list gets better and better so that all students can enjoy correct material. Thanks for replying. I love your site and it has been very very helpful to me. I got exactly this same vocab list (without meanings) from my sensei as a JLPT Level 5 portion. The words below were also included in that list. Thank you very much. Unfortunately there is no official list of vocabulary required for the JLPT. As a result lists are created reviewing historical tests and different teachers have slightly different lists. I will check if I find these words in some historical tests and add them to the list in case I had overseen them before. Thank you very much for your attention on this. Sure. Thanks for looking into this. Have a Good Day !! Thank you very much. I just repaired the link. Hello your entry has a mistake, りょうがくせい must be changed to りゅうがくせい! Thanks for pointing it out. We fixed it now. SO, I know there is a separate list of kanji that are required for the test but as far as the vocab goes to we just have to know the furigana/meaning? HAH, I should’ve read the top. Oh well, thank you for the resource. No problem. Thanks for using NIHONGO ICHIBAN. Hello! I am Usagi. The Kanji 背 is usually pronounced せ not せい, please note せい is an alternate reading for せ but it is not usually pronounced this way in sentences like “メアリーは背(せ)が高(たかい)” and “私(わたし)は背(せ)が高(たかい)”. N5 learners are more likely to need to know せ from what I have seen. Thank you for an excellent website! I’m a bit confused.Sould I memorise all 800 words in Kanji for JLPT5 test or only those highlighted in pink or those written in red? Thanks for your questions, which other might have had too. For the JLPT N5 you need to know all 800 vocabulary, but you do not need to know to read them all as kanji. 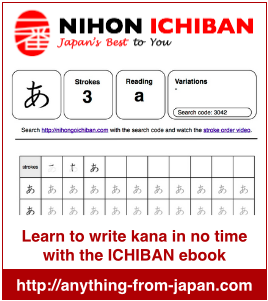 The list includes all kanji writing for those who are interested, but you only need to know the kanji writing of the vocabulary in pink to pass the test. Thank you,Nicolas.It’s very clear now.It appears much easier then. That might be a stupid question, but if the Kanji, which are highlighted here, are all I have to know, what about the separate Kanji list? I assume I have to know the 103 Kanjis from the list, as well as those here highlighted, right? Thank you for noticing ! I made the changes. 内 means inside, 家 means home and they both can be read うち. The Kanji for house is frequently use. watashi wa malaysia karakita che osman desuta…..tokidoki jikan ga attara nihongo o bengkioshitai…demo chotto muzukashi ga nihon jin no tomodachi ga imasen….nihon go o hanashi wa muzukashi ni narimasuta. Does the book need to updated or is there a mistake? Hm Please, the list for the JLPT N5, I know it’s not the official but, you colored this list, the boxes of the words are highlighted or is this just the word writed in red with link ? the kanji for oozei, 大勢 is missing but still marked red, so i guess it should be known for the test? thx, for the great site. The world oozei often comes out in the JLPT N5 but the kanji is quite complicated and thus not required for the N5 ! Hi, Sophie and Nicolas. Thanks for an excellent tool. Just noted a few mistakes and typos. 1. The word お菓子	okashi does not have a ひらがな version. 2. I don’t think the kanji for 〜だい ~dai, meaning “counter for machines”, is 〜代, but 〜台. 代 is rather used to refer to age or generation. 3. The roomaji transliteration for 真直ぐに まっすぐに should be “massugu ni”, rather than “massugi ni”. 4. The verb “to forget”, which is listed as 忘る わする wasuru, should be 忘れる　わすれる　wasureru (it’s a verb from Group 2). Again, thank you for the great tool. Thanks for pointing out the mistakes. It took a while, but we fixed it now. Sorry for asking this but I can learn to speak Japanese too from this right? I mean not only learning kanji but speaking too? I just wanna ask if this list is the combination of i-adj, na-adj and verbs lists of JLPT N5? Yes, it includes all adjectives, verb, nouns, etc. Or like you did with ageru. Putting N/A in a long list like this would cause the confusion (esp for my eyes), so I think it’s fine to leave it blank! Hi NIcolas! Thanks a lot fr the gr8 help in the form of this site!! It is indeed a boon. One correction I noticed was that of Koppu.. It should have been Kappu.. isn’t it? Thanks for providing the useful information to us. I’m glad that somebody so committed for helping peoples to learn Japanese. Hi why don’t you also include the kikurenshyu? That will be of great help. Thanks! Thanks for sharing this good idea. We keep adding more pages and function step by step but adding audio will take us quite some time as we first want to finish all the vocabulary & kanji lists. But we added this to the development list. could you give us audio file ? hai can u pls add audio for each word so that it will be helpful for learning the correct pronunciation. This question might have already been asked and answered already, but I was just wondering, since there is only 103 total kanji you’ve grouped for the N5, can I assume that much of the vocabulary on this list will be in the “furigama” format, and not in kanji? At first glance, there are quite a few kanji listed on this list that is not part of the 103 set. Yes, in N5 test most of vocabulary is in Hiragana or Kanji with Hiragana translation written above. how can i remember all the vocabs ?? i can say the Japanes also the international language. i want to learn japanes because i want to work with Japan people. And then i want to go to Japan and do the work at there. Also in my country now many Japanes Companies here. So if i know the japanes language i easily to make good conversations with them. So i will learn japanes now. Thanks for putting up such a great site .Filled with great information & such good content , it is very helpful to novice like me. Thanks! This is a great help! However, I see 675 vocab. items, where are the other 125? Hello every one, I’m a new member, I will take part in the N5 level of JLPT next July, but I don’t know what kind of Kanji I have to study. Someone please tell me those Kanji I should learn for the N5 level are the red words or words in the pink boxes? Please help me, many thanks. tnxxxx a lot very important vocabulary list for me. Hi. I’ve noticed a minor spelling mistake that you’ve made; Instead of translating suu (吸う ) as “to breathe”, you’ve put “to breath”. Apart from that, thanks for creating this list, it’s very helpful. Thanks for letting us know! we have corrected the mistake. Thanks for letting us know. It has been corrected. I’m looking for the vocabulary of the character yu (ゆ), but I can’t find it. Thank you! I have wrote all these on my notebook. This site helped me a lot. Thnx for you .it helps to me improve my Japan language.arigthogozaimasu.